This one is good, with real-life situations and unique angles. Recommended. 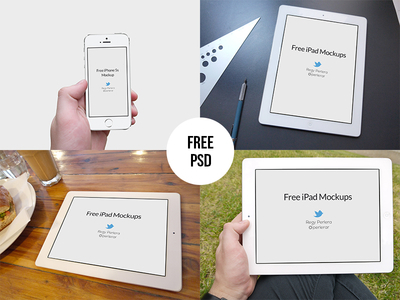 Free iPad and iPhone 5s Mockups PSD is a free Mockup design resource made by Dribbble user Regy Perlera. As far as I can tell, its license is Free for Commercial and Personal Purposes.